BOGOTÁ EATS & DRINKS: Piqueteadero "El Chorote"
eat, drink, and be happy...at 2,640 m above sea level. One of the great things about Bogota is that it's so easy to drive a little while and get away from the hectic city. On a two hour drive, or in some cases less, you can find yourself in the embrace of warm, balmy weather or in a cold, beautiful paramo. Depending on which direction you choose to drive and for how long, you're transported to another world with a different climate, flora, fauna, and food. 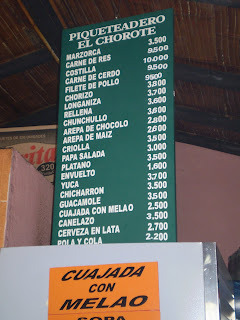 On this day our lunch destination was the Piqueteadero El Chorote. 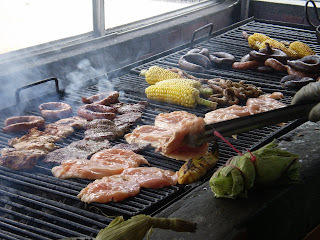 In Colombia a piqueteadero is a place where a rustic lunch is served and shared with a group of friends and family. It's usually located in the countryside and from what I gather, "piquete" is basically like a picnic. Although there is generally indoor seating available, the meal should be eaten outdoors to really enjoy the whole experience. The way this kind of place works is that you get in line to pick out what you want piled onto your groups lunch platter. The grill is right behind the person that takes orders and is filled with cuts of beef, pork, chicken, chorizo, morcilla (or relleno), corn on the cob, and much more. Of course, as I think most people do, we ordered a lot more than we probably needed to. Everything looks so appetizing and the smells coming off the grill are so good that you end up ordering absurd amounts of food. "Should we get one order of beef?" someone asks. "NO! Two!" responds a hungry friend. 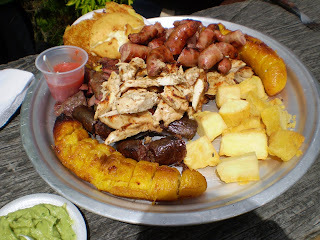 The same kind of back-and-forth continues until we emerge with an aluminum platter brimming with meats, arepas, corn, ripe plantains, yuca....enough to feed about 10 people - not 4. Somehow though, as you can imagine, we were able to devour most of the food we ordered. Sitting out on logs in a grassy lawn and overlooking the beautiful Andean mountains, it felt like we were so much further away from civilization. I'm not sure how but this was actually the first piqueteadero I had ever been to. I'd say from now on I am a big fan. It's not only about the food, which is delicious and enough reason to go in itself - but also the drive out of the city, the outdoors and the treat that it is to eat picnic-style, enjoying the fresh air and views with a few good friends. You should try the Russian one, La Dacha I think is its name. Greeeeeat food. I Love La Dacha's food !! !